If your building has had a leak or a flood, or there is a “musty smell” we can help. 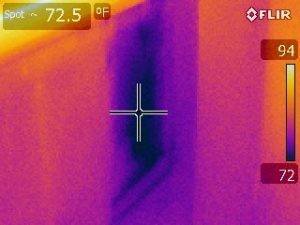 Thermograph of moisture infiltration below a window. Pre and post remediation mold testing is often performed to determine the extent/type of contamination, or simply to provide peace of mind – sometimes it is the only way to add a level of certainty that is otherwise impossible without official lab analysis. After 24-48hrs wetted building materials begin to grow mold. A moisture/mold investigation is a priority. Indoor humidity problems resulting in condensation can also cause mold to grow. Qualified professionals provide thorough inspection of building. Develop sampling plan to test hypothesis (if applicable). Report on findings from inspection, hypothesis developed, sampling results, and conclusion for next steps. Mold testing is both a science and an art. There are no established action levels for mold contamination. Bulk samples of materials can be tested as well as swab samples of surfaces for mold contamination. Air sample results are analysed using expert opinion and comparisons to outdoor background and indoor control samples. Edifice Rx has over 20 years of experience performing mold inspections and helps you understand and solve your moisture & mold problems. Edifice Rx provides the proper design and execution of an environmental sampling plan that is a central component of USP <797>. Millions of medications are compounded each year in pharmacies to meet the unique needs of patients. Medications that are required to be sterile include those administered through injection, intravenous infusion (IV), intraocular (injection in the eye) or intrathecal (injection in the spine) are compounded in clean rooms. Understanding the inherent risks in sterile compounding environments and incorporating established standards are essential for patient safety. Compounded drugs without the guidance of standards may be sub-potent, super potent, or contaminated, exposing patients to significant risk of adverse events or even death. USP General Chapter <797> includes a number of requirements, including responsibilities of compounding personnel, training, facilities, environmental monitoring, and storage and testing of finished preparations. A good environmental sampling program will not only allow a pharmaceutical compounding laboratory to know whether or not it is within the recommended action levels of USP <797>, but also provides valuable information for determining sources of potential contamination and counteracting them. Bodily fluids could be and must be treated as blood borne pathogens potentially carrying infectious diseases per OSHA guidelines 1910.1030-BBP. The IICRC S540 (2017) Standard for Trauma & Crime Scene Cleanup Section 15 covers the Confirmation of Cleaning. As with any remediation it is a conflict of interest for the remediation contractor to perform clearance testing. That’s where Edifice Rx comes in as a third party testing company. A thorough visual inspection using bright lighting and viewing items or surfaces from angles.